Azure Signature Series Digital Transmitters. 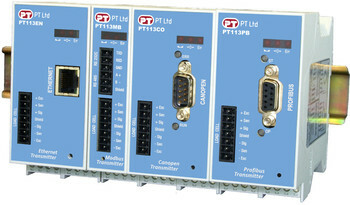 Serial, command, Modbus, Ethernet, Profibus, Profinet, CanOpen. Weighing functions: Zeroing & taring, power-on zero, AZT, net indication at power on, motion detection. Power Supply: 11-28VDC max., 300mA. Input range: 0mV to +18mV (weighing). Calibration: Span calibration with weights by RS-232, fieldbus or AzCom software. vCal for calibration by direct entry of load cell characteristics with AzCom software. In count mode all instruments are factory calibrated for on site calibration in the PLC. Weighing Functions: Tare, zero, auto zero tracking, motion detection, auto-zero at power-up. Digital Filter: Adaptable filter adjustable in 10 steps. Modbus RTU: 1200 to 57600 baud, programmable, up to 31 units on the RS-485 bus. Modbus TCP (on Ethernet): 10 Mbit/s (half duplex), galvanically isolated. PROFIBUS: PROFIBUS DP V1. 9.6 kbit/s to 12 Mbit/s automatic baud rate detection. PROFINET: 100 Mbit/s (full duplex), galvanically isolated. EtherNet/IP: 10/100 Mbit/s (full duplex), galvanically isolated. CANopen: 10 kbit/s to 1 Mbit/s automatic baud rate detection.